svBuilder is a desktop application that allows you to easily build SimpleViewer galleries. svBuilder will automatically resize images, generate thumbnails and create the required XML and HTML embed code. If you don't have it already, download and install Adobe AIR. Download and unzip SimpleViewer to your desktop. Double-Click the svBuilder.air file in the SimpleViewer download folder and follow the prompts to install. (On Windows you may need to right-click and select 'Run as Administrator...'). svBuilder runs on Windows, Mac and Linux. To resolve installation issues, check here. Browse for images or add via drag and drop. 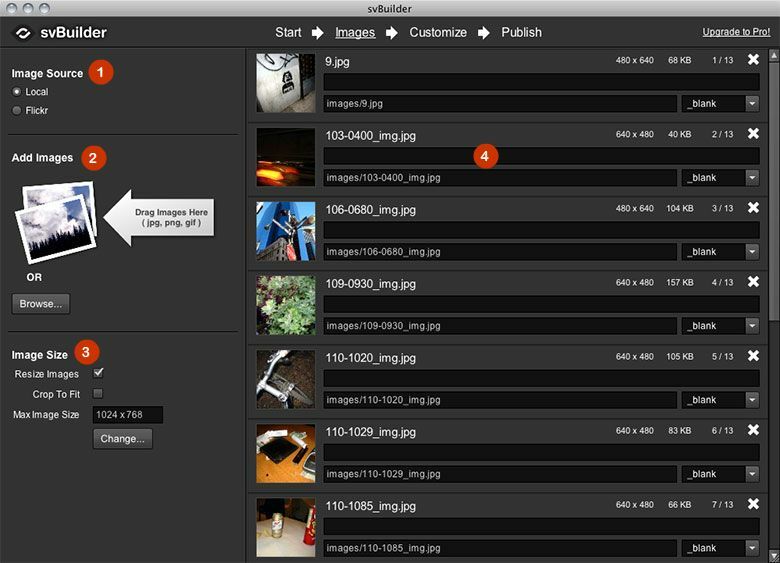 To change image order, drag and drop images in the image list. Enter image caption text in the image list items. Click 'Customize' button on top menu. Modify config options, or select a gallery preset. View a description of all config options here. Click 'Publish' button on top menu. Click 'Browse...' to a select a new gallery folder location. Click 'Save' to save your new gallery and open it in a browser. There are 4 main panels that make up the svBuilder interface. Use the top menu to switch between panels. Image Source. 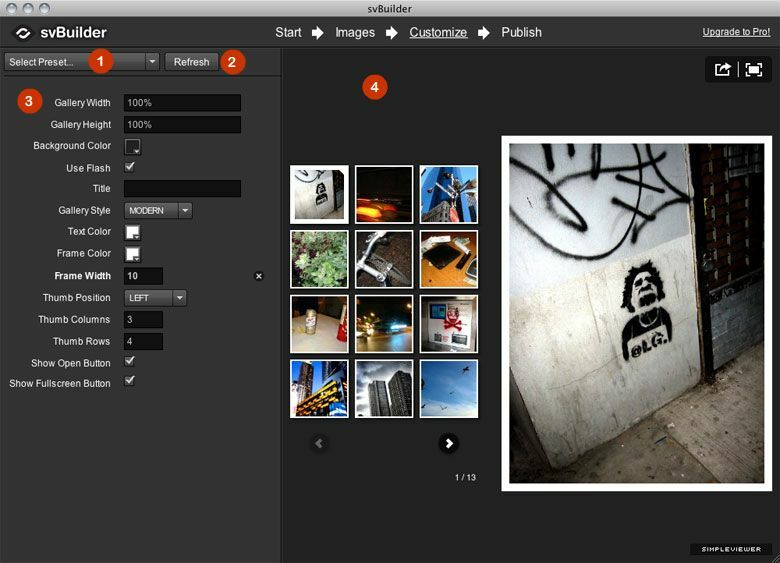 Select either local images or Flickr Images. Add Images. To add images to your gallery, drag and drop images from the file explorer, or click 'Browse...' to select images on your filesystem. Image Size. Check 'Resize Images' to make svBuilder automatically resize imported images to the specified dimensions. Check 'Crop To Fit' to make svBuilder crop images to the exact specified image dimensions. Click 'Change...' to change image dimensions and quality. Image List. Displays all images in the gallery. Drag and drop images to change image order. Double-Click thumbnail to preview image. Enter image caption in top field. Enter image link URL in bottom field. Select or enter linkURL in bottom-right combo-box. Use the Rotate button to rotate images. Use the Delete button to remove image from gallery. Preset List. Select from a choice of gallery presets. Create new presets using Config -> 'Save Config As Preset...'. Refresh Button. Click this to refresh the Live Preview. Config Options. Modify config options here. Config Options are described here. Click the 'X' clear button to return an option to it's default value. To update the value in a text input box, press the 'Enter' key or select another text field. Live Preview. Displays the current gallery images and options. Save Gallery. Click 'Browse...' to select a new gallery folder location. Click 'Save' to save your gallery folder and optionally open it in a browser. Set the gallery HTML document name in the 'Index Page Name' textbox. Get Embed Code. Click 'Copy To Clipboard' to copy the embed code for your gallery. Paste this code into any HTML document to embed your gallery. View the SimpleViewer Embed guide for more details. Presets allow you to easily save and load gallery configuration options. Once you have customized your gallery to your liking, you can save the current gallery config options as a 'preset'. A preset is an XML file, similar to the gallery.xml file that contains a list of config options. To save current gallery options as a preset, do Config -> 'Save Preset...'. This will save the current gallery options as a preset file. By default, preest files are saved in the svBuilder applications 'presets' folder. The 'Select Preset...' drop down menu is populated from this folder. To load a preset select it from the 'Select Preset...' drop-down menu on the Customize panel, or do Config -> 'Load Preset...'. This will overwrite the current gallery options with the contents of the preset file. New - Create a new gallery. Open - Open an exisiting gallery. Save - Save current gallery to selected gallery folder. Preview... - View current gallery in a browser. Add... - Browse to select images to add. Remove All - Removes all images from gallery. By File Name - sort images by file name. By File Date - sort images by file date. Reverse - reverse image order. Use File Name - sets caption to image name. Use Link URL - sets caption to a text link to image's link url. Use None - clears captions. Load Preset... - Select a preset file to load into the current gallery. Save Preset... - Save the current options as a preset file. New presets will show in the 'Select Preset' menu. Revert To Defaults - Clears all current config options. Mobile Gallery is not displayed in svBuilder. To view the mobile gallery, save it and view in a web browser. Previewing a Flickr gallery locally does not work. Check here for the solution. Previewing the Mobile player locally in Chrome does not work. Use a different browser or upload your gallery to a website to preview. Gallery caption hyperlinks do not work in svBuilder. Gallery keyboard controls are disabled in svBuilder. If the live preview gets out of sync with the specified config options, click the 'Refresh' button to reload your options. svBuilder assumes the gallery xml file is in the gallery folder and called gallery.xml. 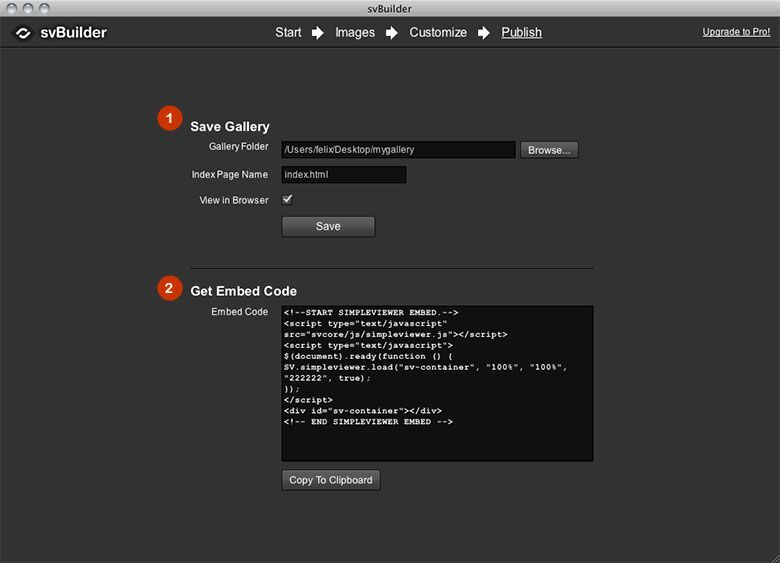 If you are using the galleryURL option to place the XML somewhere else you will need to temporarily switch it back to use svBuilder. svBuilder requires Adobe AIR 2.0 or higher. View Adobe AIR system requirements.To resolve Adobe AIR installation issues, check the AIR Installation Troubleshooting Guide. For Linux, install the Adobe AIR 2.6 Linux runtime. On Windows - You could be launching the installer from a restricted file system or network drive. Try copying the installer to desktop and install from there. On Mac - Unmount drives other than main drive (including time machine backups) and retry installation. It's possible that the application didn't download completely. Retry downloading the installer. If you receive the message "This application cannot be installed because this installer has been mis-configured. Please contact the application author for assistance." you need to uninstall the previous version of svBuilder before installing the new version. On Windows: Use Control Panel -> Add / Remove Programs. On Mac: Delete the 'svBuilder' file from Applications folder. Delete any copies of svBuilder on a backup drive. Then do 'Empty Trash'.